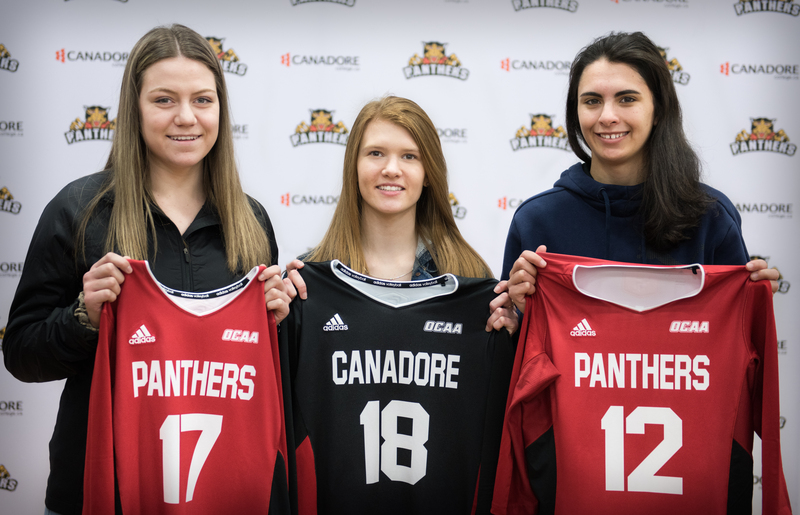 Canadore College women’s varsity volleyball coach Andrew Nicholson proudly announced three new recruits during Canadore College’s Open House on Saturday, April 1. Jessica Veley: Timiskaming District Secondary School; from New Liskeard, Ont. Coach’s comments: Jessica has a tremendous on-court presence and is a true leader. We look for Jessica to become one of our more vocal players and add depth to the very important setters position. Madisyn Gaudette: Almaguin Highlands High School from Powassan, Ont. Coach’s comments: Maddie brings an ‘edge’ to our Middle Blocking position. Her Almaguin coach says that Maddie only wants one thing from her teammates and that is to match her desire to win! We could always use more ‘win at all costs’ attitude on the team. were lacking that ‘win at all cost’ attitude last season so Maddie will address that for us. Katie Albert: Elliot Lake District High School,, from Elliot Lake, Ont. Coach’s comments: Katie is a formidable presence at the net! She blocks extremely well and hits a very heavy ball. Our goal with this recruiting class was to add physicality at the net and toughness throughout the line-up; Katie brings both of those attributes to her position. Jessica, Madisyn and Katie are joining the Panthers hot on the heels of an exciting season.